Welcome to week 2 of making color work for you (here’s week 1 if you missed it). This week we’re going to start the process by determining whether you are a warm (Spring, Autumn) or cool (Summer, Winter) season. In general, warm palettes should have you envisioning warm desert like areas, ie brown sand, burnt oranges, green cactus etc. Cool palettes make you think of the Arctic, ie ice blues and whites, black and white penguins, and gray huskies. Let’s start by taking a look at gold and silver. During a color analysis, drapes would be used to put across your shoulders/ chest and you would immediately see whether warm or cool tones looked best on you. Since you probably don’t have drapes lying around, instead take some of your necklaces and earrings and try on first the gold (warm) and then silver (cool) and see which makes your features pop. Your eyes, skin and teeth will all look better when you’re wearing the correct tone. I am a cool season which means that silver is the best metal for me to wear. Although it is obvious that silver is a better option for me, this is also a rule that I tend to break because gold is so extremely popular right now. What I would never do, is pair black with gold. I mentioned before that black is not on my color palette, so pairing these two colors would be a very bad choice for me. When I do wear gold, it’s typically with a soft, cool, pastel color such as I did here. Let’s next take a look at your hair which can be a great indicator for determining your palette. Warm hair colors have golden and red hues. This would include browns or blondes with hints of red, copper or auburn. 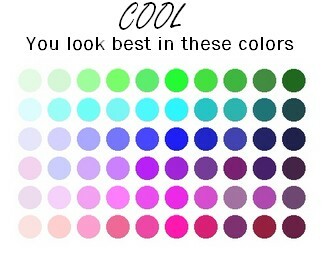 Cool hair colors in comparison have no red or gold. Cools can be platinum blonde or jet black, brown or ash brown. When looking at your eyes, regardless of their color, warm hues will have flecks of gold, brown, red/brown or olive. Cools would include any gray tones and dark eyes such as deep black, black brown or charcoal. Blue eyes would show white, gray or blue tones. Skin tone is a bit trickier to use when determining if you are warm or cool. When looking at the color of your skin, look not only at your face, but also the insides of your wrists. 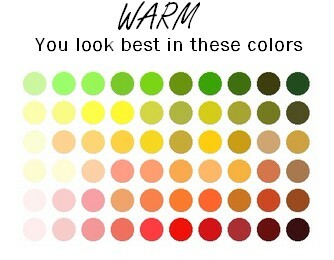 If you are warm you’ll see a peach, ivory, golden, caramel or dark coppery beige tone. Another clue (but not in all cases) for a warm are freckles. Those with cool tones on the other hand, will find blue veins when looking at their wrists and/or blue, pink or cool red undertones. This can be any shade ranging from pale beige to ebony black. Porcelain skin and rosy or gray freckles are also signs of a cool skin tone. This is just the first step in determining your season, so be sure to check back next Wednesday when we’ll dive in deeper to decide which specific season you fall in to. This is awesome Marisa! I was a bit unsure about mine until you explained the skin tones, and that cleared it up for me. Can’t wait for more! My hair & eyes seems to fall under the warm category. But as far as skin tone when you look at my wrist you can see the blue veins. I’m stumped! I spoke to my mom who’s been a color analyst for over 20 years now. She says it’s extremely difficult to analyze without being in person, but our best guess is that you would fall into a cool season. I don’t know if your hair is currently colored, but you’d need to judge your hair based on your natural shade. Dark hair and dark eyes typically fall into the cool seasons. Hopefully this helps a bit!